Intending to build a swimming pool, it should bedetermine not only its location and shape, but also with a view of the lining - the finishing touch to the work. Facing materials perform both an aesthetic function, and are of great practical importance. Therefore, a means to the final stage should be chosen with great care. 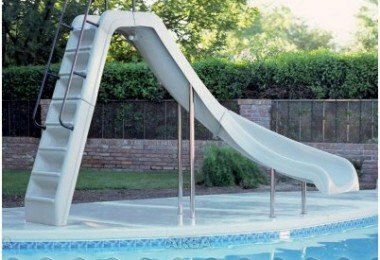 The best option is a decoration film for the pool, which is now very popular. As oblitsevat Pool film with his own hands? The film coating, although inferior in quality, and mosaic tile finish, renowned customers. And there are good reasons. The film - a facing material of new generation, at the same time helping to solve two problems: the coating of the cup and the waterproofing of the reservoir, regardless of its size, shape and type. The innovative technology allows the glue filmonto any surface: stone, concrete, plastics, tiles and iron. This durable and reliable material is resistant to the means to care for water and exposed to microorganisms. A wide selection of colors and variety of patternsdo cover this type extraordinarily beautiful. Facing with the help of the film takes place in the shortest possible time and ensures tightness (even the appearance of cracks in the bowl). The film - a very durable material, which consists ofseveral layers, which are interconnected network of reinforced filaments. It is ideal not only for the construction of new tanks, but also for the renovation of old ones. The upper layer has a rough surface - a guarantee of anti-slip effect. To properly put the film has a remarkable knowledge is not necessarily: to read quite carefully to the instructions and strictly follow it. In addition, the cladding method - excellentoption for zealous owners who want to save money and, and decorate the swimming pool. Reasonable price will allow everyone to buy a versatile material for waterproofing and decoration. 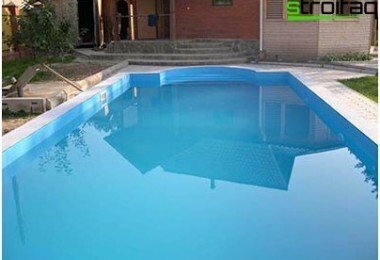 Unfortunately, despite the many advantages, the film waterproofing for pools It has its drawbacks. Life is only 6 years old. She is spoiled, fade and can lose its original shape. If any of the external waterproofing on the inside wall of the pool under the film there are bubbles. A (due to exposure to ultraviolet light) appears noticeable difference color coating underwater and above the surface of the film using a skimmer type in a couple of years. In sub-zero temperatures the film is prone to failure, which creates a need for thinking through methods of "conservation" of the pool for the winter. 1. PVC film - a synthetic coating based on plasticized PVC. Special impregnation protects against the negative influence of bacteria, fungi and spores present in the water. 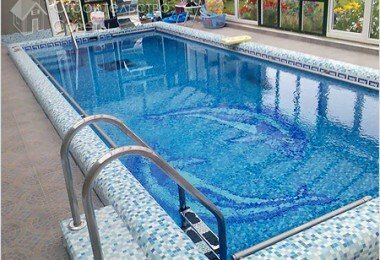 PVC film for the pool can be of different thicknesscross section: 1.2 mm; 1.0 mm; 0.8 mm; 0.5 mm. 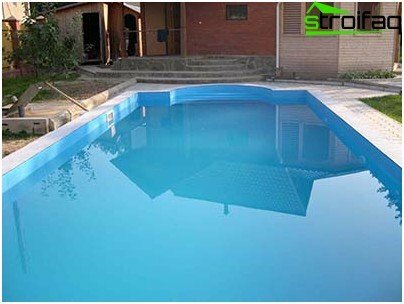 The thickness is selected according to the type of swimming pool. For shallow water reservoirs used film 0.5 or 0.8 for deep bowls - 1.0 and 1.2 mm. The length of the rolls is independent of the thickness - 25 m, a width - 2.4 meters and 6.8. The color palette is varied: white, turquoise, beige ... It allows you to select an instance in accordance with your preferences and fantasies of the designer. 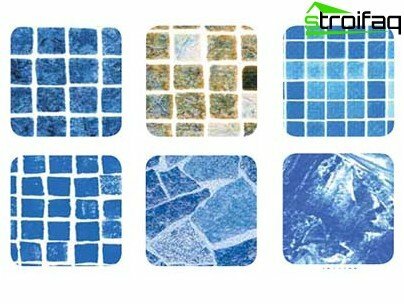 There is a PVC film for the pool with marble, mosaic and other patterns, which gives a special kind of pond. 2. Butyl film which is characterized by improved ductility and durability performance. It is easily cut with scissors and glue. Such a film is good for large tanks where the strength of special importance. Butyl tape is not afraid of the changing seasons, as well tolerated variations in temperature and pressure, and thus is suitable for use with any surfaces even during the harsh winter. When the film thickness of 1 mm can have a width of 3.05 m; 6.1 m; 9.15 m; . 12.2 and 15.25 m length changes as follows: 15.25; 30.5; 45.75 and 61.0 m.
Ply material eliminates leakage and increases service life. First of all, we should define the amount you intend to spend. In the case of waterproofing materials, the price - quality mirror image, so if you want to buy good products, have to fork out. Owners of large pools notrounded and relief form is worth paying attention to the road and thick samples. You can choose a more economical option for small water bodies with a smooth bottom. thickness - a criterion on which the period of the film coating life depends. To film the pool finish was performed according to the rules, should focus on a few points. pond surface should be smooth, without potholes and sagging (roughness less than 2 mm). pool board should be strong (when drilling at a distance of 4 cm from the inner edge of the chips should not be). conjugation sites should withstand an angle of 90 degrees (except areas drops at the bottom). deviation in the vertical plane should not exceed 3 mm. fitting pieces must be of a flange connection. you must maintain a distance from the bottom and walls up to the fixing of 30 cm. to the side wall tiles need to proceed after application of the film coating. 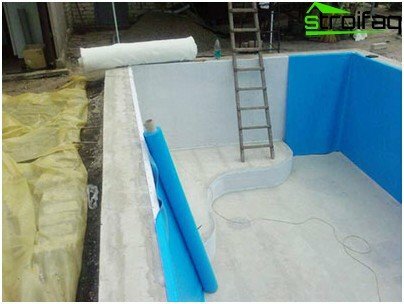 to avoid the appearance of bubbles and wrinkles, as well as violations in the future of waterproofing properties of the film, it is necessary to plan the bowl protection against groundwater. The process of cladding consists of 4 steps. In the presence of bumps and roughness neededsanding the bottom. If there are potholes - they need to putty. In the case where the surface lead to proper form by the above methods is not possible, to align. When aligning a side, make sure that the alignment layer is adjacent to the base with no tendency to delamination. The film can be laid directly on the old tiles, making sure that it rests firmly. In the case of tiles peeling have to make its dismantling. 2. Laying the substrate and the mounting strip. The substrate is needed to protect the film from abrasion of the bowl pool. On the walls of the substrate mounting strip secured to the film which then is welded. Fixing strip - the metal strip (length -2 m, thickness - 2 mm), onto which a plastic coating. Secured strip with screws. Frequency zasverlivaniya - 10-15 cm from the top corner of the inner wall of the reservoir. The main thing - to prevent the imposition of epigastric sheets on top of each other and the formation of wrinkles. If necessary, use an elastic adhesive. 3. Placement of the film. To ensure the integrity and perfect appearance, it is necessary to adhere to the welding technology and comply with the cleanliness of work surfaces. In the field of welding sheets should "grab" the rapid heating and compression, thus avoiding the formation of unsightly furrows. After welding the junction treated with a special sealant joints. 4. Filling of water. First, the pool water is poured a layer of 30 cm - to pull the vertical layers of the film. Further mounted flanges fitting pieces, and then the reservoir is filled with water to the desired level. The water temperature for the first filling should not exceed 40 degrees. Done! The film coating is laid, the pool is filled, and now is the time to enjoy your holiday on the banks of the pond of their own, and the idea that this masterpiece - the result of your efforts, make doubly pleasant vacation.